There are many compact SUVs to choose from, but for those who desire a sporty off-road utility vehicle with rugged styling, the XV is an ideal choice. It was just introduced last year and is already among the top vehicle picks in its class. For those unfamiliar with it, the XV shares many of the same features as its cousin the Impreza; it is not only built off the same proven platform, but also features the same advanced horizontally opposed BOXER engine and trademark Subaru all-wheel-drive system. Still, it also differs from the Impreza in many key ways, too. 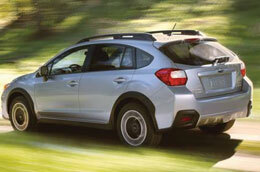 Learn more about it in the continuation of our 2014 Subaru XV Crosstrek review. If you've been considering utility vehicles like the Dodge Journey or Nissan Xterra, you may find that the XV actually offers a better-rounded package of affordability, features, power, performance and style. Plus, it's not just a larger variation of the Impreza; it's also an enhanced off-road machine. Unlike its cousin, the XV is offered as a compact SUV with added body cladding that can endure tough backcountry environments - branches, rocks and all. The SUV also has a higher ground clearance, perfect for traveling outdoors, and its specially tuned suspension can handle rougher rides. This year, local shoppers will not only find the 2014 Subaru XV Crosstrek for sale in Kansas City, MO, but also an all-new XV Crosstrek Hybrid. Head over to 90 NW Vivion Road to see it for yourself today! Along with a money-saving and emissions-limiting gas-electric powertrain, the hybrid also comes with a specially tuned chassis that offers more agile handling. Please stop by Monday through Saturday during regular business hours to test drive the 2014 XV Crosstrek and all-new XV Crosstrek Hybrid in Kansas City, or fill out the form on the right to schedule an appointment in advance. For more information, please read the rest of Van Subaru's XV Crosstrek review below. Please call 844-873-7968 for further assistance. Compare Subaru's newest model of the XV Crosstrek to its rivals and we're positive that you'll choose it over vehicles like the 2014 Jeep Compass, Mini Cooper Countryman and the Mitsubishi Outlander. 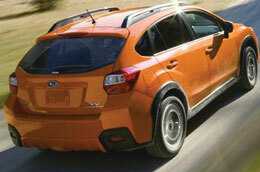 Shoppers will be thankful for the XV Crosstrek's competitive sticker price, as well as its splendid exterior design. Many drivers in Kansas City choose it because it's a phenomenal value; compare its price to the vehicle options listed above to see for yourself. Glance over our XV Crosstrek Facts list; look just below this paragraph for bullets. 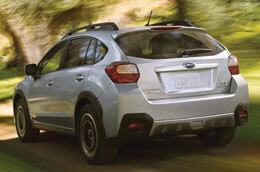 Now that you've read the 2014 Subaru XV Crosstrek review above, please contact Van Subaru for a test drive. Our reviews are composed by skilled automotive writers - it's just another resource we provide as a respected Kansas City area Subaru dealership. Jam-packed with reliable information and specs, each overview gives you complete details about all the XV Crosstrek has to offer Kansas City drivers in terms of cabin features and much more. 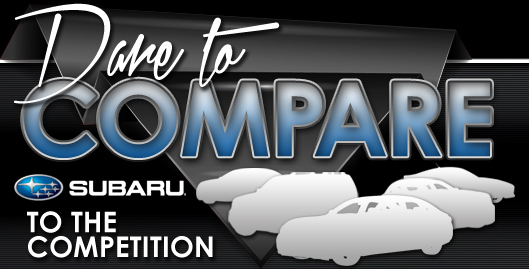 Want to read other Subaru car comparisons and reviews? Then visit our digital research index page, where you'll learn about other new vehicles from Van Subaru.